Paper Back : 196 Pages. Size 26 x 19 cm. Contents : More than 1000 MCQs, Overview of the Topic, Answers with Brain Storm, Specimen Papers. About this book : This book contains More than 1000 MCQs classified into 19 topics. Each topic starts with an introduction, which gives the important concepts of the related topic. Explanation to each MCQ is given to help the students choose the correct answer to each multiple-choice question. Answers to MCQs are also provided at the end of each topic. 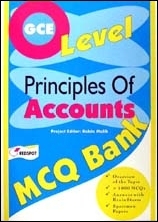 This book is highly recommended for the students who are preparing for the O Level Principles Of Accounts examination.